When comparing U.S. prices with international markets for 2015, Birmingham in the United Kingdom had a higher price than the United States, reaching its highest average price in September at $4.22 per kilogram, which was 67 percent higher than the U.S. price that month. 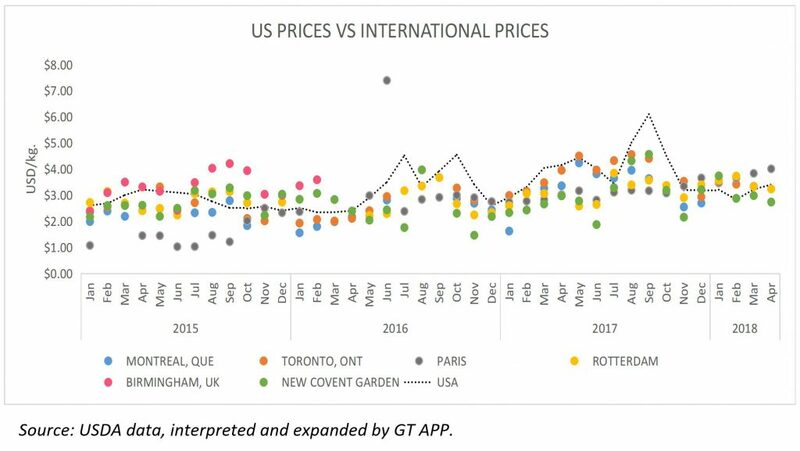 After February 2016, international pricing was lower than in the United States, with the exception of Paris, which reached a price of $7.41 per kilogram in June, and New Covent Garden Market (United Kingdom), which climbed to $3.98 per kilogram in August. For 2017, Toronto reached higher prices than the United States in May at $4.51 and then again at $4.57 per kilogram in August. From December 2017 to February 2018, average monthly prices were higher than the United States in Rotterdam, the Netherlands, by 13 percent and in Paris by 18 percent. New Covent Garden’s prices were 16 percent over U.S. prices in January 2018.